Metromatics offers two distinctly different rugged high bright LCD designs typically used for Passenger Information Displays (PID’s) at bus, tram and train stations. Both are highly reliable and backed by almost a decade of Engineering expertise. Yet, by changing the physical design we have been able to slash manufacturing costs by 40%. The X-series, equipped with a door, makes on-site servicing possible. H-series does not have a door, making it cheaper and reducing your capital expenditure. In this article, we’ll compare the two distinct designs to help you decide which design is right for your organisation. Do you want to employ the technical expertise to manage product servicing or use a pool of rotatable spares swapped out by low skilled workers? So why would anyone even care about a door on the front of the X-series display? In a word, serviceability. Servicing and periodic inspections are possible with a door. A door is replaceable in the event of vandalism. A single technician with no equipment other than a ladder, screwdriver and multimeter can diagnose and rectify faults on site. Maintenance staff do not need a high degree of technical knowledge. They simply swap out the faulty display with one from the rotatable pool of spares and send the broken display away for repair. The H-series is up to half the weight of an X-series, making this a viable option. For serious faults, like an LCD failure or smashed glass, a rotatable pool of spares means display up-time can be kept high. This is of particular importance at critical transport hubs servicing tens of thousands of people every day. As already mentioned, both the X and H-series are highly reliable. Both use components with mean times between failure (MTBF) in excess of 50,000 hours. That’s 24/7 operation for more than 5 years. But what about mean time to repair (MTTR)? MTTR is a basic measure of the maintainability of repairable items and represents the average time required to repair a failed component or device. Serious damage caused by vandalism can take weeks to repair, blowing the MTTR way out and impacting customer service. By leveraging the lower price of the H-series to create a pool of spares, the MTTR is pulled in, improving operational availability. So if having a door is so great, why create a door-less model in the first place? Well, it’s cheaper. 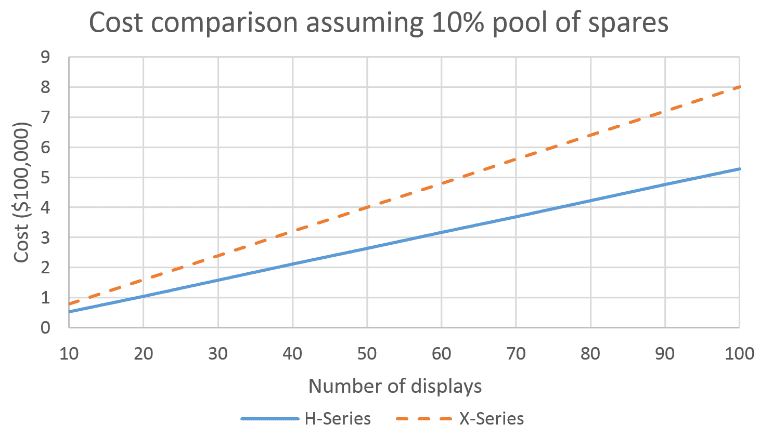 If you do a like for like feature cost comparison of X-series and H-series, the H-series will cost 40% less. With purchasing departments are under more pressure than ever to keep capital expenditure low, the savings offered by cheap imported products can be tempting. But with poor reliability, these cheap imports mean sacrificing the long-term maintenance budget and increased downtime. The H-series lets you have your cake and eat it too. Thanks to some smart design choices of our Engineering team, the H-series is a rugged extremely reliable high bright display at a rock bottom price. 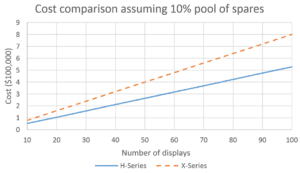 Typically, three H-series displays will cost less than two X-series displays. This means for large installations you can hold a 10% pool of spares and still reduce your capital cost by as much as 34%. You already employ technicians on staff capable of servicing on-site. Your OHS rules don’t require a team of people to change a light bulb. You don’t have the tools (i.e. scissor lift) to safely remove larger displays mounted high off the ground. Why such a big price difference? A door adds a lot of material and labour to the build cost. For example, metal is folded and welded; locks, hinges, door stays and rubber seals need are fitted and the bezel around the screen requires more materials as it must be larger to accommodate the door seal. The table below is a handy comparison of the X-series and H-series, highlighting their relative pro’s and con’s when going head to head with each other. Same reliability as H-series. More expensive. Same reliability as X-series. Pool of spares need to be kept. Same IP rating as H-series (IP65) Heavy. It is up to twice the weight of an H-series display. Same IP rating as X-series (IP65) Whole display must be replaced in the event of glass vandalisation. Can be serviced on site. Damage to door seals may reduce the IP rating. 40% lower cost. Lifting devices or work platforms required to remove large units for repair. Except for major faults (i.e. LCD failure), system can be repaired within 30 minutes or less where spares are taken to site. Requires qualified technicians to service. Thinner & Lighter* Whole display must be swapped out in the event of any component failure. Enclosure is large enough to house extra client equipment and the door provides easy access. While the H-series is typically smaller, its depth can be increased to house client equipment at an additional cost. Door can be replaced in the event of vandalism. Maintenance staff do not require technical training. Repair work can be outsourced. Smaller bezel allows larger displays to be fitted in small spaces. Pool of spares leads to lower down time in cases of LCD failure or smashed glass. *Final weight will vary depending on internal equipment and glass options. If you are still not sure which design is right for you and your organisation, please get in touch with us. We would be happy to help you make the right choice.